If you have a busy home - and families with children and pets certainly fit that description - you need to pick a floor that is durable and long-lasting. We have good news for you! You don't have to sacrifice style to have a floor that can withstand foot traffic, occasional indoor hockey games and dogs chasing kids. Let's review two practical and pretty flooring choices for busy families. Surprised to see carpet as a practical flooring choice? You shouldn't be. 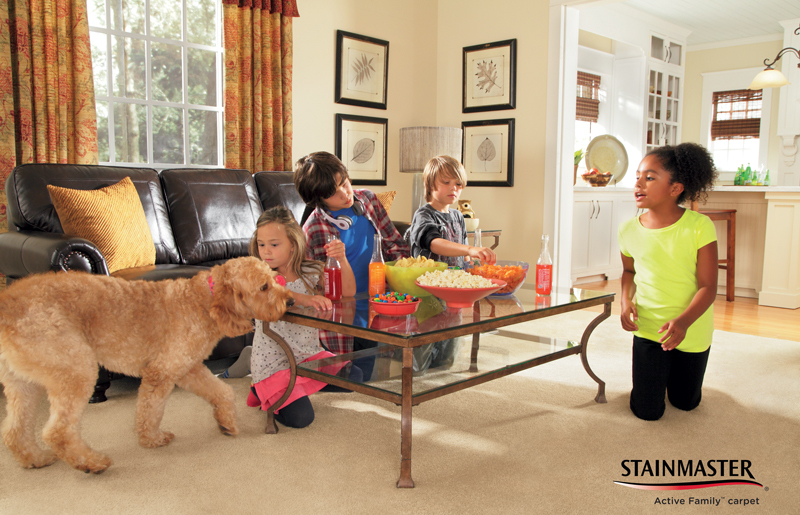 Carpet is one of the most affordable choices of flooring on the market. And it comes in such a wide variety of styles that you can find the perfect type to stand up to your lifestyle and still be comfortable and quieting under foot. Whether you choose loop, cut pile or a textured carpet (a mix of looped and cut fibers, you're sure to find just the right carpet for your busy home. With the word resilient in its name you can bet this is a floor choice that is built to withstand just about anything. As the name implies, resilient flooring is able to handle a lot of traffic and bounce back beautifully. With a full range of designs - including some that beautifully mimic natural hardwood and stone - and a price that's budget friendly it's no wonder that it's becoming one of the most popular floors in our showroom. From luxury vinyl tile to waterproof composite flooring, there's an option of resilient flooring that's just right for your home. Comfort is important. You can find a durable floor style made for a factory but it's going to feel like sandpaper underfoot. You can find flooring that is both comfortable and durable. Keep maintenance in mind. A busy family has high maintenance needs when it comes to flooring - from dirt and debris tracked inside to spills and stains. You need a floor that can stand up to it all, and there are choices out there that make maintenance a breeze. Don't sacrifice your sense of style. Resilient flooring comes in styles that look like natural wood or stone tiles. Carpet comes in a practically endless array of colors, patterns and textures. The practical floor that you need is out there in the beautiful floor that you'll also love.